When I started this I planned on putting up movies that were kids movies and a food that went with the theme. well I realized that we watch a lot of family movies around that just don't have a good snack or dinner that matches the movie theme. This week we bought Courageous the movie on Amazon. It is the firsts time I have bought a movie that is not a hard copy. I can watch it on my Kindle or use it on my computer. I am hoping it allows me to burn it to DVD. So If you are planning on watching this movie and you are a sap like me get some Kleenex. Really! I cried through this movie a lot. This movie is a humorous and action packed movie. It is about a police force that is shown the reality of the impact on society from fatherless homes. They deal with gang related activity in their job. When tragedy strikes that directly impacts an officers family he reaches out for the help of a pastor to teach him all that god has asked of fathers. These men are called to the duty of holding each other accountable to the resolution they all signed. The resolution is to become a better husband and father by giving 100% to do as god wants them to.This is a family friendly movie that empowers men to want to become better fathers and husbands just by watching it. It may take courage to cook try this but once you do your family will love it. There is never left overs when I make this. This was something that my MIL taught me how to cook when she lived with me. 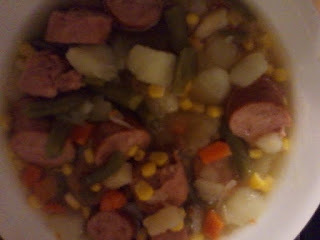 My recipe this week is a quick and easy sausage soup. This is made with the broth from the beef that was cooked for BBQ Beef Sandwiches the other day. Jim sifted it 3 times after cooling it to get all the grease out. 8 Potatoes pealed diced and boiled until they still have a slight firmness to them. 2 pounds polish sausage we use the big pack of Eckridge and we pealed the skin off. While cooking the potatoes boil your cut up meat in the broth with your onions. You will want to add seasoning if your using a canned broth. I did not have to as Jim had seasoned the meat when he cooked the roast the other day so our broth was seasoned. When potatoes are done drain them and add them to the meat and broth. Add the rest of your ingredients, cook for about 20 minutes. If you want to cook it longer on low or place it in the crock pot on low or you can just serve it. It can also have any veggie added to the potatoes when you cook them if you want like carrots, celery or cabbage. It is all up to you what you want to add to this. Hi there. The current Food on Friday is all about sausages! So it would be great if you linked this in. This is the link . Have a good week. Thanks I linked to you. I will try to share your page when I make that again so my readers can see more recipes.